Coffee is our heritage and there’s nothing we love more than the perfect ‘cuppa. Our founder Edwin Henry Booth would travel the globe as far back as 1847 to discover the finest tea and coffee for his shop in Blackpool. Blended and roasted in-house at Preston, this carefully chosen coffee selection features four of our favourite coffees and if that isn’t enough, it also comes with a book filled will over 100 unique coffee recipes designed to suit every taste. 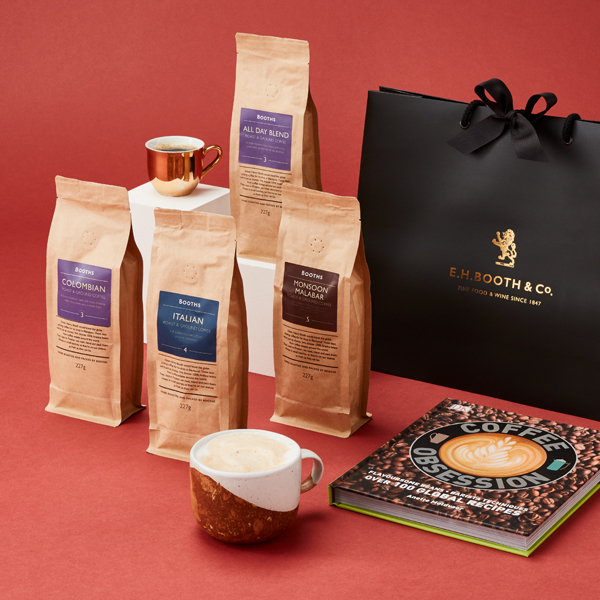 This delightful gift will take the coffee lover in your life on a journey from bean to cup as they experience the most refined selection of our best-loved coffees. This is the perfect gift guaranteed to make somebody say ‘Thanks a latte’!